As the crisis in the Western World deepens, and the growing reality sets in that business as usual simply can no longer continue nor solve our problems, our systems must change the way they view, deal with and hold onto power. The NHS is no exception. 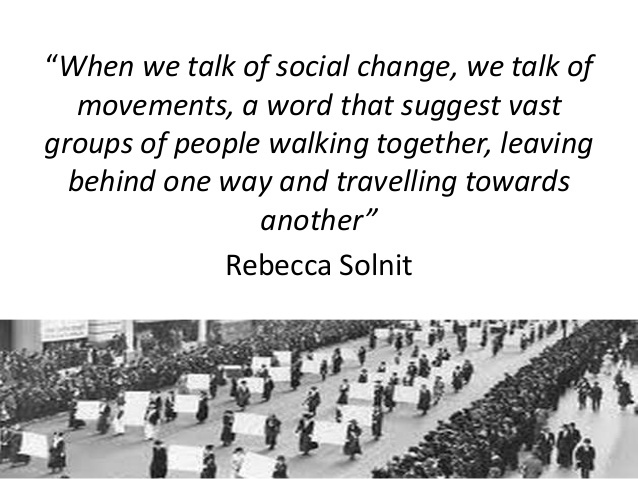 If we want a health and social care system that is of the highest quality, safe, sustainable and economically viable for the future, we need to understand the power of social movements, both within our systems and through the wider society. 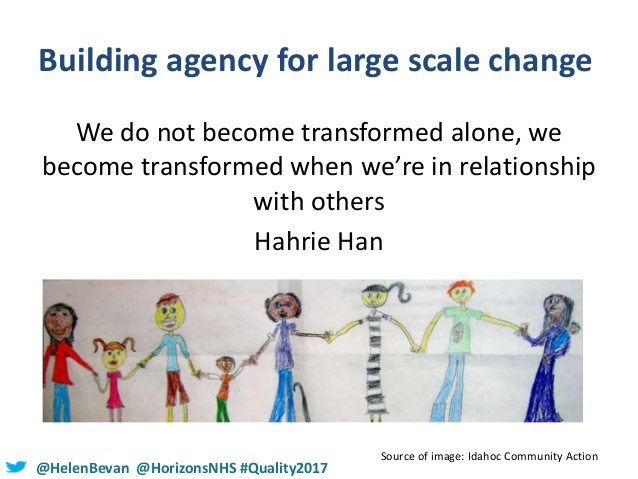 This is something we are really committed to in Morecambe Bay and so it was with great delight that I listened to the excellent Helen Bevan, talk about just how vital social movements are for the NHS and healthcare, worldwide at the recent IHI conference in London, Quality 2017. This blog will be an amalgamation of what Helen shared and my own thoughts about our early experiences with social movements. 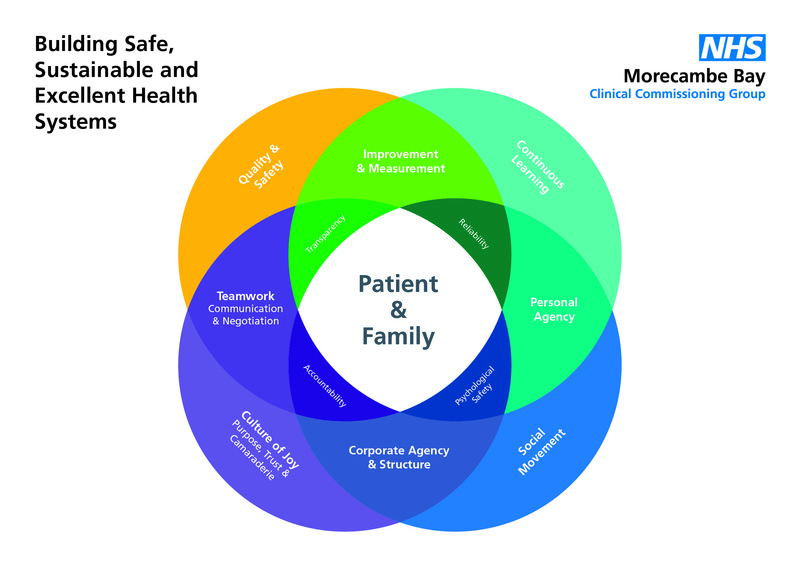 A social movement in health and social care involves us all learning to connect, collaborate, cooperate, cocreate and coproduce at a level we have never done so, until now. But our circumstances are forcing us to reconsider the ways in which we work. We need the creative substance that is within our teams to be heard and harnessed so that we cut our waste and work more effectively together. The issues we face, need facing by us all, together; not by some board in an isolated room, making decisions based on diktats from on high, on behalf of us all. But even this will not be enough. Those of us stuck in the system have become too homogenized in our thinking for us to do this exclusively from within. We need our citizens to help us re-imagine what it means for us to be healthy and well. We must stop designing things for our communities or doing things to them, instead we must design and do things with them. We must analyse, create and enact together and to do this, we must learn to solve the issues of power. 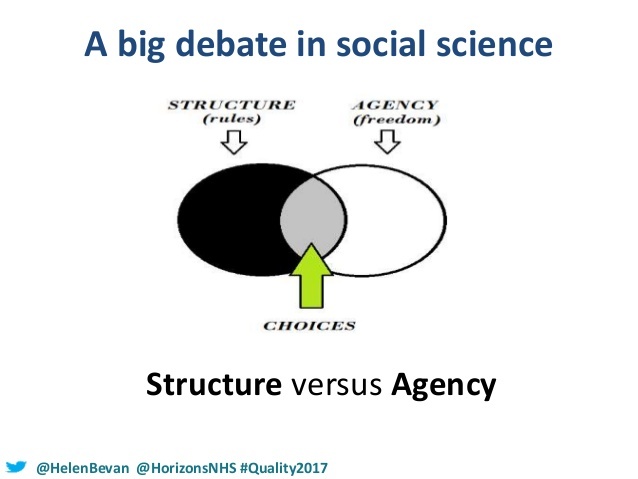 Helen Bevan, with her background in social science, demonstrates the great debate about the interplay between our organisational structures (rules) and agency (freedom) when it comes to effecting change. Where does the “permission” come from to enact the change we need to see? Is it externally generated by those in positions of power, or is it internally generated by a personal motivation? Our experience in Carnforth and Morecambe in community conversations has been a bit of both. There are many people of incredible heart and goodness, waiting to do something new and good that will positively affect the health and wellbeing of society, but are perhaps waiting for that sense of community backing, support, encouragement or indeed permission. With a bit of coaching or spurring on, we have seen some amazing initiatives begin that are bringing transformational work into our area and causing us all think differently. We need both individual agency AND corporate agency. 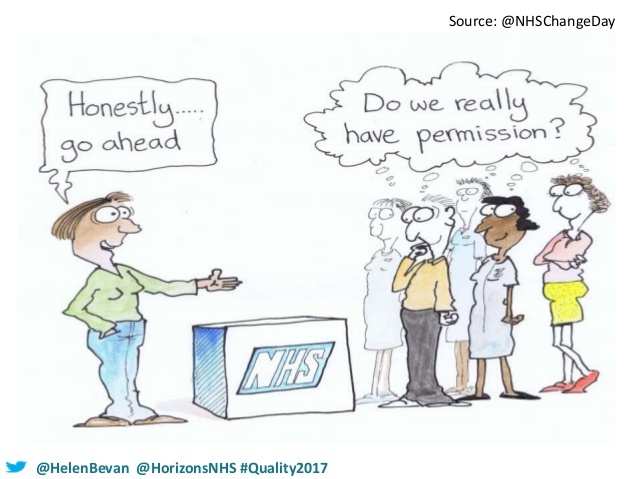 Helen describes individual agency as being when people get more power and control in their lives – we see this in patient activation, shared-decision making and self-care – a greater sense of autonomy and responsibility. Collective agency, on the other hand, is where we see people act together, united by a common cause, harnessing the power and influence of the group whilst building mutual trust. We have seen this used powerfully, in just one example by our maternity liaison service committee, who together have challenged our system to think more carefully about how we communicate to women, especially at key or stressful moments of their obstetric care. These stories are now a compulsory part of training for all who work in our maternity service and have significantly improved both our skill mix and ability to provide excellent care. What is absolutely vital to understand is that we do not become transformed alone. We are transformed when we are in relationship with others (Hahrie Han). The problem is that we don’t really encounter the “other” enough to be changed. 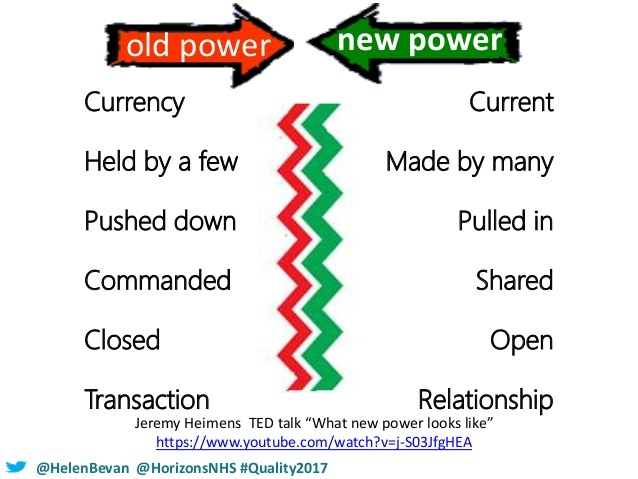 However, when we let go of the kind of power that is held by the few, pushes others down, uses command and control, that is closed and transactional, and instead embrace a power that is held by the many, shared, open and relational, then we can begin to see the change we need (Hirschman and Ganz). 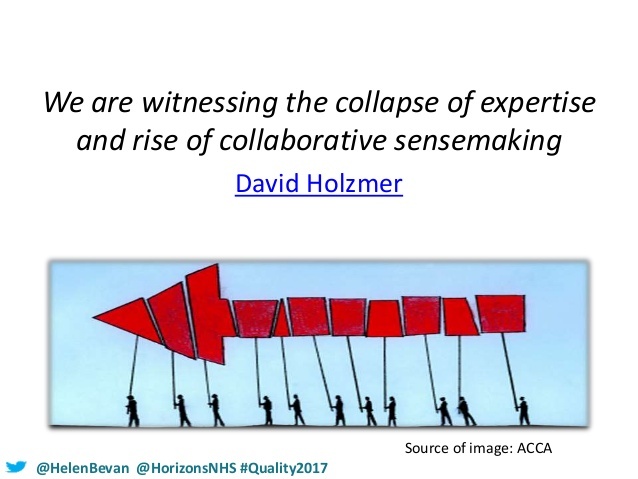 David Holzmer says that we are witnessing the collapse of expertise and the rise of collaborative sense-making. I would suggest that this has been going on for some time, but our systems have been incredibly slow at catching onto the change around us. 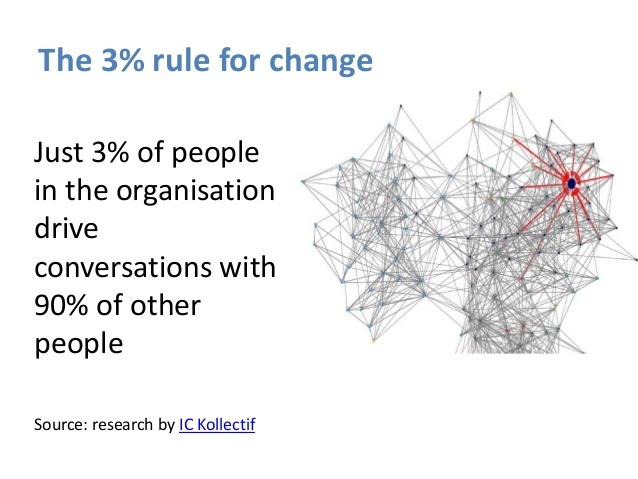 Now, what is hugely encouraging is this: research by Kollectif shows that you only need 3% of people in an organisation/society to drive the conversations with 90% of other people. In other words, you don’t have to get everyone on board from the word go. You find your passionate people with a sense of agency, infect them with the virus and watch it spread. These people need to be a mixture of ‘lone wolves’, mobilisers and organisers. Lone wolves are people who have been trying to help change happen for a long time but can sometimes feel like an annoyance to the system, so they are given tokenistic positions, patted on the head and patronised into exhaustion. Mobilisers build power by calling large numbers of people to contribute, engage in change and take action. Organisers build power by growing leaders in a distributed network, building a community and protecting its strength. 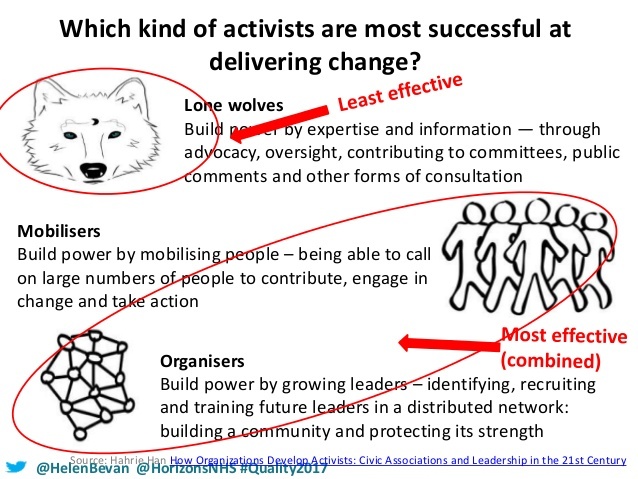 We need all of them, though mobilisers and organisers will be the most effective in creating agency and bringing about lasting change (Hahrie Han). Joe Simpson says that ” great social movements get their energy by growing a distributed leadership.” The cult of celebrity can be powerful, but is not effective. The beautiful thing about a social movement is that is depends not on money, materials and technology but on relationships, commitment and community, and as the movement grows, these resources increase, rather than diminish. The problem, as Don Berwick puts it, is that leaders in position of strategic influence, are simply not seeing the resources available to the biggest problems we are facing. Jason Leitch and Derek Feeley have powerfully shown that performance management (keeping the power), based on targets, sanctions and inspections can only get us so far. 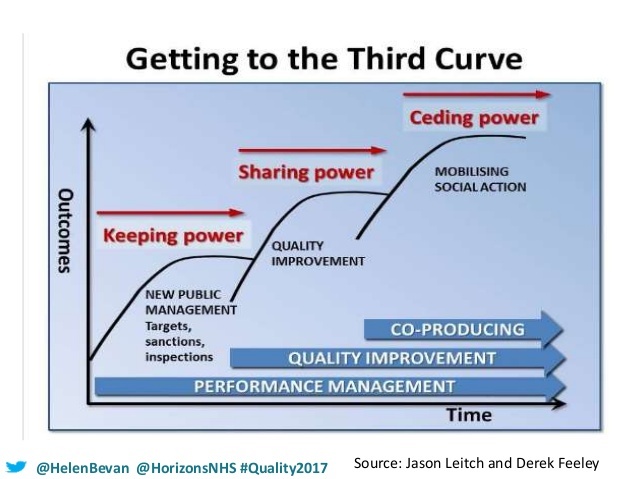 Quality improvement (sharing the power) gets us a little further, but mobilising social action, or co-production (ceding power) has a far greater potential to bring lasting change and far better outcomes for all. 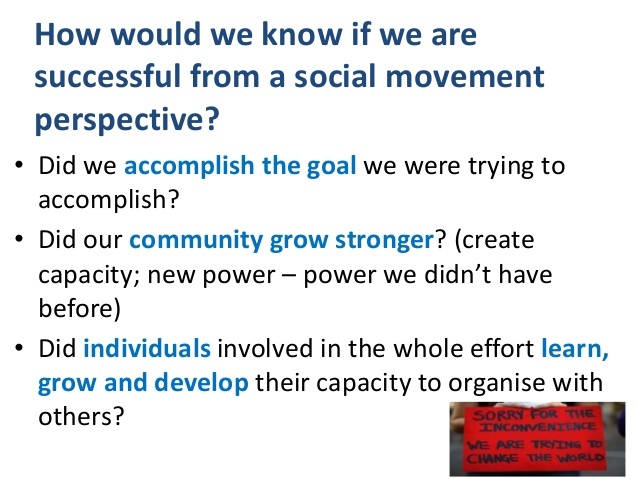 So, how do we catalyze a social movement and how would we know if the movement was being “successful”? Well, our experience in Morecambe Bay is that you start with the 3%. You start with those who are drawn to the conversation, who recognise the need for change and who want to be part of it. You start with transparency, with openness, honesty and vulnerability about the mess we find ourselves in and the truth that we no longer have what it takes to solve the problem. And you start with really good questions and then deeply listen to the conversation which is emerging so that we ourselves are changed and can therefore be part of the emergence of something new, which operates on an entirely different kind of power. You might call this a re-humanisation of our systems based on love, trust and the hope of a positive peace for all. But this social movement is not aiming for some kind of hippy experience in which we are all sat round camp fires, singing kum-ba-yah! This social movement is looking to cause our communities to flourish with a sense of health and wellbeing, to have a health and social care movement that is safe, sustainable, socially just and truly excellent, serving the needs of the wider community to grow stronger with individuals learning, growing and developing in their capacity to live well. That is what we must measure! 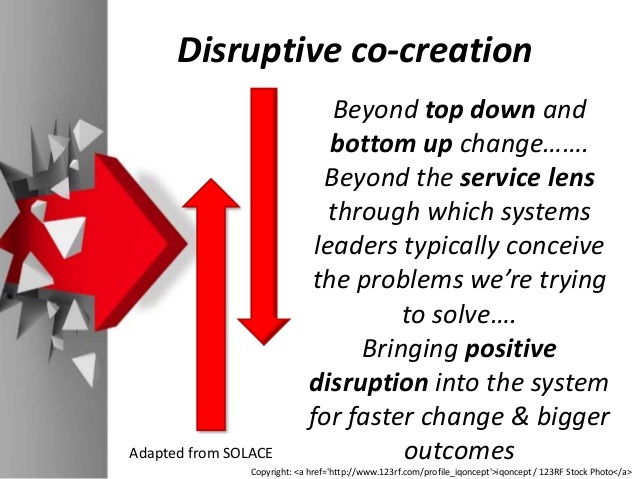 And so we need disruptive co-creation, which breaks through the top-town/bottom-up approach and causes us to see and hear like we have never done before. 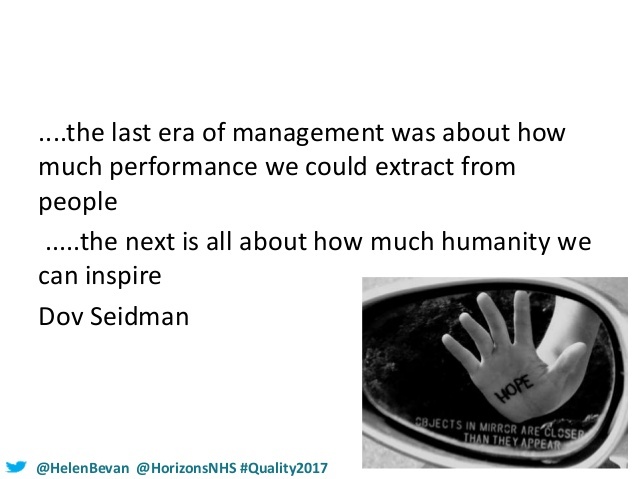 It is hugely exciting and enables managers to stop feeling like they have to extract as much performance as possible from the system, flogging the workforce, blocking change and innovation and inadvertently driving down the quality of care in the process. The invitation is instead to become part of the change that we all long for. If we’re going to have an NHS in the future, we have to give it back to the people and work with them. In order to do this, we have to deal with and change our relationship with the very notion of power – something I will turn my attention to on the next blog!